We’re transmitting our signal straight to you! 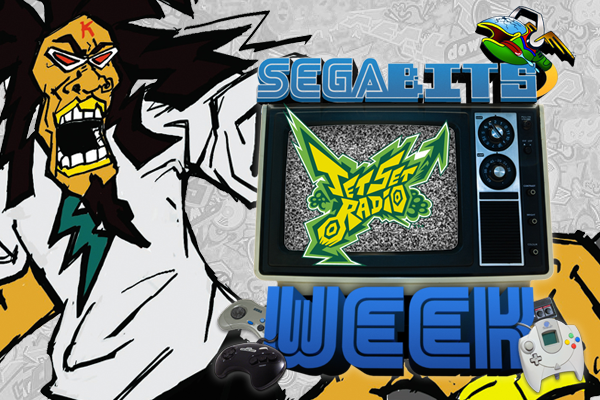 Y’all got your antennas on?Welcome to Jet Set Radio Week – a week long celebration of SEGA’s off-kilter cel shaded Dreamcast classic! Past SEGA Franchise Weeks focused on more than one game, but Jet Set Radio Week is going to be different. Rather than splitting our time between the Dreamcast original and its radically different Xbox sequel Jet Set Radio Future, we’re devoting the next seven days to simply Jet Set Radio. But don’t fret, Jet Set Radio Future will have its own week soon enough! Like Sonic The Hedgehog on the Genesis, and NiGHTS on the Saturn, Jet Set Radio on the Dreamcast turned heads with amazing visuals, memorable music, and unique gameplay mechanics. Jet Set Radio (Jet Grind Radio in America) may not have taken off like SEGA had hoped, but it did do well enough to warrant the previously mentioned sequel and has since become a SEGA cult classic. After the break, let’s take a look back and how such a crazy concept for a game came to be. 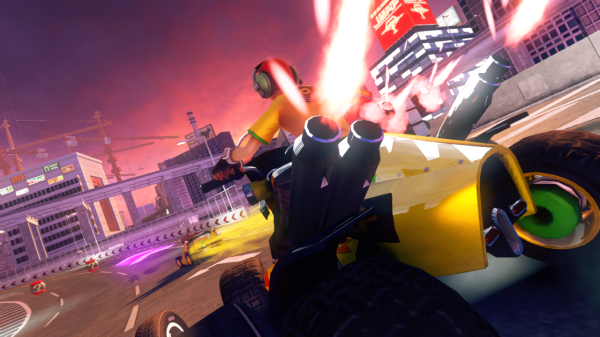 The game’s director, Masayoshi Kikuchi, started with a vague inline skate concept and put an emphasis on the game’s visual impact. The graffiti element, a series staple, was not an element in early development. In Kikuchi’s opinion, “We could have made it into an adventure game or an RPG”, revealing that the team considered several scenarios for an eye catching game featuring punkish inline skaters. In the end, it was decided to go a more simplistic route, but after many ideas were thrown around – including a game in which you simply walk about a cool looking city – nothing of any real excitement took shape under the “make it simple” direction. Finally, after a lot of hard work and trail and error, the team at Smilebit came up with a game that melded skating with a run-from-the-cops arcade style game in which rival challenges and graffiti skills were the key to level progression. In typical SEGA fashion, Smilebit went against the norm and wanted a visual style that was not the usual developer ambition of creating a highly realistic world. Looking to manga and anime for inspiration, Kikuchi chose to create a visual style that best emulated a flat illustrated look. After researching various graphics techniques, he landed on cel shading. The game’s signature cel shaded look was revolutionary at the time, giving the game the feel of a living cartoon. Later games would use this style including the Dreamcast’s own Wacky Racers and Looney Tunes Space Race. But applying the style on the Dreamcast was not an easy task, as Kikuchi described the process as “extremely challenging”, but as evidenced in the final game they were able to pull it off. SEGA, worried that the unique cel shaded art style and uniquely “Japaneseness” of the game would alienate players in territories outside Japan, implemented a few changes to in an attempt to make the game more Western friendly. 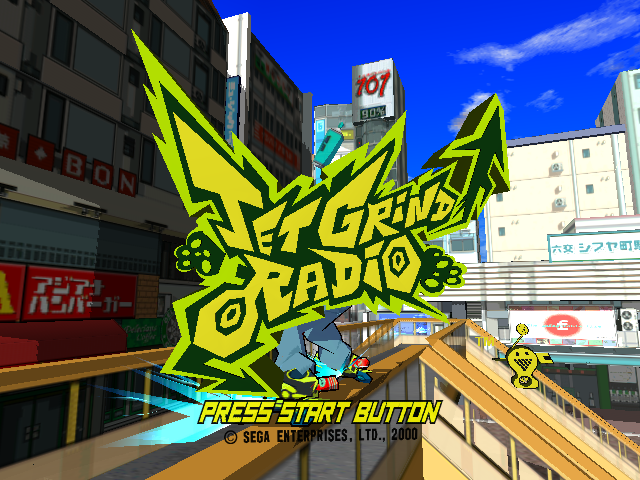 In the United States, the game received a name change replacing the “Set” with “Grind” making the game Jet Grind Radio. 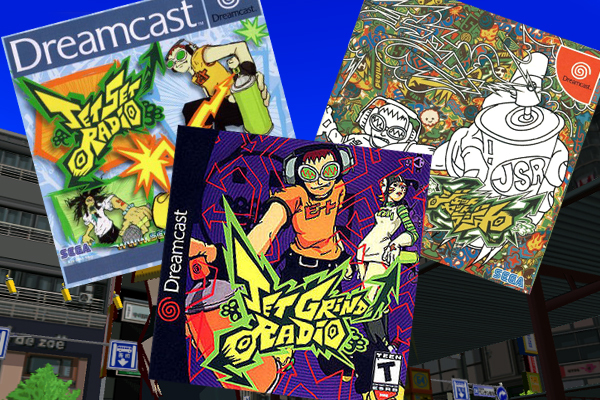 Fans have theorized that the reason was that “Jet Set” had caused some sort of copyright issue, however when asked about Jet Grind Radio in an interview with Games™ Ueda and Kikuchi couldn’t explain the change. It’s possible that the SEGA of America PR team wanted to emphasize the grinding mechanics in an effort to catch the attention of Tony Hawk’s Pro Skater fans. Also of note, Sonic Adventure 2 was only 8 months away and it too had grinding mechanics which were shown to the public as early as E3 2000. The biggest change to both Western releases was the addition of two new levels, which took place in the fictional American Grind City. Additional plot details were also added, which treated the Grind City stages as a flashback presented by Combo and Cube who were looking for their kidnapped friend Coin. Combo and Cube were changed to be American’s seeking help from the Japanese GG’s, Combo delivered the narrative during the Grind City segments while Cube’s clothing was altered to give her more of an American goth girl look. Coin, who resembled an American skater, only appeared in static cutscenes and was never playable. Smilebit were not happy with these changes ordered by SEGA, Ueda especially felt that his pride was hurt. The original Jet Set Radio was a celebration of what made Japan cool and hip, and Ueda felt adding foreign stages watered down the game. Despite being against the additions, Ueda couldn’t help thinking of what additional ideas he could implement in the new stages. The end result of Grind City were nowhere near as big as the original stages, but they did offer up fun additional content to an already expansive game, the Grind Square stage especially feels like a precursor to Jet Set Radio Future‘s more insane vertical stages. With a game like Jet Set Radio, the gameplay and graphics required equally brilliant music. The game’s amazing soundtrack featured a number of tunes by Hideki Naganuma, an in-house SEGA musician from 1998-2009. Other artists included Deavid Soul, Guitar Vader, Richard Jacques, and many others including some which were exclusive to the US and PAL versions of the game. Combined with Kikuchi’s direction, Ueda’s art, and Naganuma’s memorable music, the three made up the core group that truly shaped Jet Set Radio. The three would reunite with 2002’s Jet Set Radio Future, creating a very different sequel that explored new gameplay elements and pushed the art style and graphics even further. In the years that followed, Kikuchi and Ueda went on to work on SEGA’s Yakuza series, even going so far as to insert a reference to Jet Set Radio in the first Yakuza by having the game’s enemy Goji Rokkaku appearing in a side mission. Ueda even mused that the cameo confirmed that Yakuza is in the same universe as Jet Set Radio. The cameos even work in reverse, as Kikuchi pointed out to Games™ that the character Garam has a necklace that resembles Sonic the Hedgehog’s skull. While Jet Set Radio has yet to see a third title (fourth if you count the Game Boy Advance release), the series has gone strong with appearances in SEGA’s Superstars and All-Stars games. Beat and Gum appear in SEGA Superstars Tennis with a court set in the original game’s Shibuya Bus Terminal. A Jet Set Radio Future Beat appeared in Sonic & SEGA All-Stars Racing with three tracks: Shibuya Downtown, Rokkaku Hill, and Highway Zero. Gum made her debut to the racing series and Beat returned in Sonic & All-Stars Racing Transformed, with both sporting their original designs. 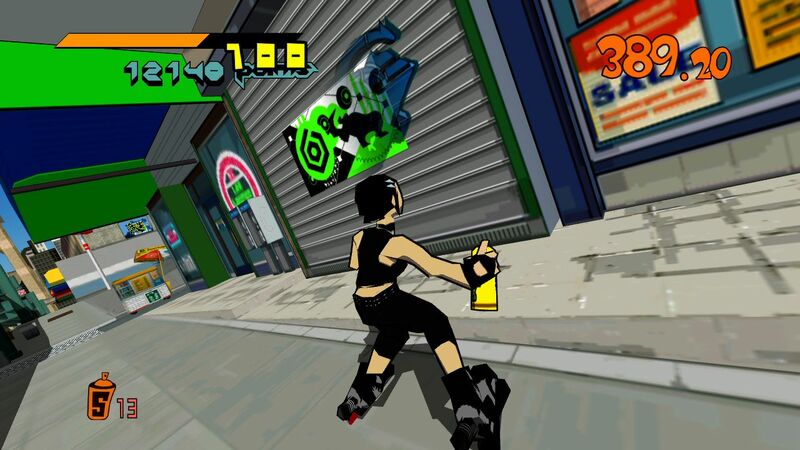 The game featured an impressive Jet Set Radio track, dubbed Graffiti City, and had cameos from series skaters and included unreleased dialogue from Professor K and newly remixed music from Jet Set Radio veteran Richard Jacques. Jet Set Radio (ジェット セット ラジオ), called Jet Grind Radio in North America, is a video game developed by Smilebit and published by Sega for the Sega Dreamcast. It is a third-person action game in which the player controls members of a rebellious gang called the GGs, roaming the streets of the fictional city Tokyo-To spraying graffiti to “take over” the area from rival gangs. 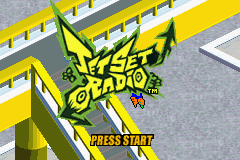 Jet Set Radio for the Game Boy Advance is a watered-down version of Jet Set Radio, originally released for the Sega Dreamcast. It was developed by Vicarious Visions and published by Sega and THQ. 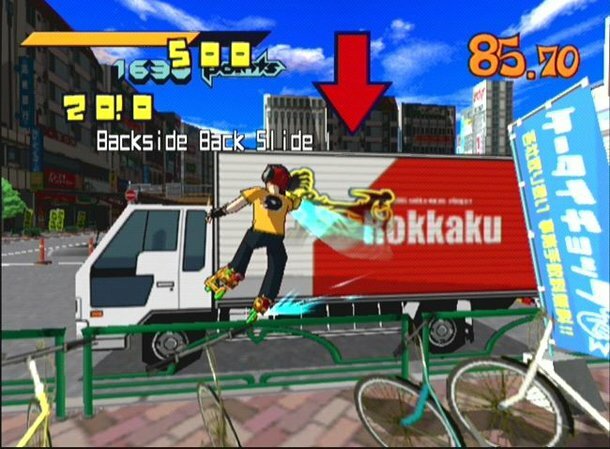 As with the original, it is called Jet Grind Radio in the US. Jet Set Radio Future (JSRF ジェットセットラジオフューチャー) is a Xbox exclusive and pseudo-sequel to the Sega Dreamcast game Jet Set Radio. As the name suggests, it is set in the future (2024). It was released at the beginning of the Xbox’s lifespan, and was eventually bundled with Sega GT 2002 on a single disc as a pack-in game with the system. But wait, there’s more! A reader on Twitter clued us into one other Jet Set Radio game, 2001’s Typing Jet – a Java game for mobile phones in which players avoid obstacles and run from the police by typing in characters. Other games released alongside Typing Jet included a mobile version of Typing of the Dead, Ulala’s Channel J, and Columns Jr.
Stay tuned for tomorrow as we feature a few of Hideki Naganuma’s favorite tracks from the original game! I think SEGA must back to life this serie. Everyone always seems to say “Come on, Sega, please, JSRF HD…”. Thing is, do you realized what system it was on? The Original XBOX, if JSRF was remade, they probably would make the stupid decision to put it on 360 and XBOne, and no other system. What about De La Jet Set Radio? De La Jet Set is just a re-release of the American Jet Grind Radio in Japan; because they didn’t get the two American style levels in their original release of Jet Set Radio.